Introduction. Address by the Director of the Department of Energy Bartlesville Project Officer (T.C. Wesson). Microbial Enhanced Oil Recovery - The Time is Now (Keynote Speech) (D.O. Hitzman). MEOR in the Field: Why so Little? (V. Moses). A Brief Introduction to the Progress of MEOR in China (T.L. Qin and G.H. Yang). Research. 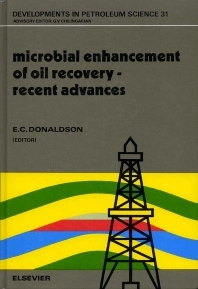 Microbial Physiology and Enhanced Oil Recovery. (A.J. Sheehy). Analysis of Biomass in Rock Cores Following Nutrient Stimulation (D. Gevertz, R.M. Solis and W.A. Wood). Bacteria-Mineral Surface Interactions in a Laboratory Model Reservoir Environment (F.K. Hiebert et al.). Investigations of Microbial Mechanisms for Oil Mobilization in Porous Media (K.L. Chase et al.). Mechanisms of Oil Displacement by Microorganisms (S.A. Kianipey and E.C. Donaldson). Isolation and Characterization of Anaerobic Halophilic Bacteria from Oil Reservoir Brines (D. Gevertz et al.). Isolation and Characterization of Novel Halophilic Anaerobic Bacteria from Oil Field Brines (V.K. Bhupathiraju et al.). Anaerobic Microbial Degradation of Aromatic Hydrocarbons (D. Grbic-Galic). Strict Anaerobic Bacteria and Their Possible Contribution to the Enhancement of Oil Recovery (S.S. Belyaev, I.A. Charakchian and V.G. Kuznetsova). A Method to Determine the Number of Hydrocarbon Degrading Bacteria in Microbial Enhanced Oil Recovery (A. Lichaa and C. Oppenheimer). Effects of Sodium Chloride on Growth and Metabolism of Two Strains of Clostridium (M.M. Grula et al.). Effects of High Pressure and High-Pressure on Microorganisms (R.E. Marquis). Production of Biosurfactant by Bacillus Licheniformis Strain JF-2 (S.C. Lin et al.). Enhanced Oil Recovery at Simulated Reservoir Conditions (E.C. Donaldson and T. Obeida). High-Temperature, Salt-Tolerant Enzymic Breaker of Xanthan Gum Viscosity. (M.E. Slodki and M.C. Cadmus). Microbial Ecology of Corrosion and Reservoir Souring (D.W.S. Westlake). Degradation of Glucose and Production of H2S by a Consortium of Thermophilic Bacteria under Simulated Reservoir Conditions (J.T. Rosnes et al.). Prospects for Thermophilic Microorganisms in Microbial Enhanced Oil Recovery (MEOR) (E.T. Premuzic and M.S. Lin). Fate of Surfactant Vescicles Surviving from Thermophilic, Halotolerant, Spore Forming, Clostridium Thermohydrosulfuricum (T.F. Yen et al). Transient Transport of Bacterial Suspensions in Natural Porous Media: Modeling of the Adsorption Phenomenon (P. Cheneviere et al.). Compositional Numerical Simulation of MEOR Processes (A.K. Sarkar, M.M. Sharma and G. Georgiou). Field Applications. Characteristics of the Bacterial Inoculum used in some recent MEOR Field Trials in Romania (I. Lazar et al.). Preliminary Results of Some Recent MEOR Field Trials in Romania (I. Lazar et al.). Microbial Enhancement of Oil Recovery from Carbonate Reservoirs with Complex Formation Characteristics (M. Wagner). Microbial Enhanced Waterflooding: A Pilot Study (R.S. Bryant and T.E. Burchfield). Biotechnology of "Enhancement of Oil Recovery based on the Geochemical Activity of Microorganisms (Field Experiments) (M.V. Ivanov and S.S. Belyaev). Microbial Selective Plugging to Control Water Channeling (T.R. Jack et al.). Microbial Control of the Production of Sulfide (M.J. McInerney, K.L. Sublette and A.D. Motgomery). Microbial Enhanced Oil Recovery Treatments and Wellbore Stimulation using Microorganisms to Control Paraffin, Emulsion, Corrosion and Scale Formation (J.W. Pelger). Advances in Research, Production and Application of Biopolymers used for EOR in China (W. Xiu-Yuan and X.Y. Wang). Appendix. MEOR Field Trials Carried out over the World during the last 35 years (I. Lazar). This conference was instituted to examine field activities in Microbial Enhancement of Oil Recovery. The U.S. Department of Energy has sponsored several field projects and the details from some of these were presented, as well as a few from industry. The balance of the program was concerned with new developments in research. Today's oil production technology leaves one third to one half of the original oil in place in the reservoir at abandonment of secondary recovery (waterflooding). This leaves a very large target for microbial enhanced oil recovery which was shown by the research papers of this conference to be capable of producing up to 50% of the residual oil. The field trials show that the normal projected oil production decline curve can be reversed, or leveled off by microbial enhancement of oil recovery. This conference has shown that a variety of applications are possible to correct oilfield problems as well as to enhance oil recovery. Among these is the suppression of hydrogen sulfide production which alone is a tremendous advance because of the large quantity of sour oil production. If hydrogen sulfide production can be curtailed it would increase the value of the produced oil, decrease it toxicity, and largely decrease it corrosiveness. All of these would be welcome both in the field and at the petroleum refinery where special precautions must be taken to process sour crude oil. Another very important discovery is the ability of certain bacteria to eliminate paraffin deposition around the producing well and in the tubulars. This is a welcome improvement for many producers who have considerable difficulty in controlling paraffin deposition.